The ELOS team met Iker Zirion, International Public Law professor at Euskal Herriko Unibertsitatea, Leioa, on 2nd March. Students discussed the topic and worked on a SWOT analysis (Strengths, Weaknesses, Opportunities, and Threats) related to gender equality #SDG5. Today is not 11th February, but we would like to celebrate the International Day of Women and Girls in Science every day. We have identified role models reading Zientzia Kaiera, Mujeres Con Ciencia and following the hashtag #EmakumeakZientzian on Twitter, but we have also met young scientists who are doing a great job on STEM. Now we are sharing our work with you and we hope that after reading our articles, you remember some of these great women and their contribution to science. Padlet by students of AZKOITIA B.H.I. The Elos team invites you to use this material we are using to prepare the meeting with the expert Iker Zirion, International Public Law professor. The event will take place in Leioa, EHU-UPV on 2nd March. You will find material in English, Basque and Spanish. Feel free to add more interesting articles and videos. ELOS ikastetxeetan hizkuntzen aberastasuna eta kultura aniztasuna ezagutzera eman nahi dugu ekintza honekin. Ikastetxe bakoitzak bideo bat sortu du eta ELOS taldeak beste bideo bat sortu du taldean egin den lana erakusteko eta kultura arteko ezagutza hedatzeko. 20 students of 1. 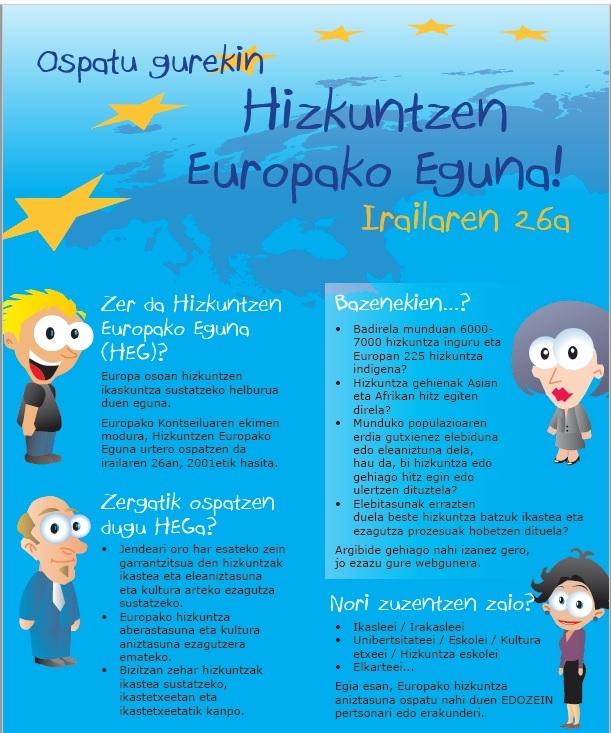 Batxilergoa from 5 different schools will take part in this activity to celebrate the European Day of Languages in Europe. They will be seated in four tables and they will be answering questions for 15 minutes at each table. As a result of their debates, they will create a digital presentation in English. Maiatzaren 9rako ikasleei honako proposamena egin diegu. Nola irudikatzen duzu Europa irudi batean? Ikastetxe bakoitzak hiru argazki aukeratu ditu eta batzuek lehiaketa eta guzti antolatu dute. Another beautiful day at work by Lukas Martínez, 1HT.